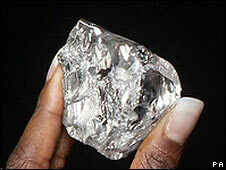 September, 2008 - a diamond weighing 478 carats was discovered in a mine in Lesotho, South Africa. It is the 20th largest uncut diamond in the world. The center of the diamond has been deemed 'perfect' and is likely to yield the world's largest cut diamond, weighing about 150 carats and worth tens of millions of dollars. That would dwarf the current record-holding diamond, the 105-carat Kohinoor in Great Britain's Crown Jewels. The largest rough diamond found was the Cullinan, in 1905, which weighed 3,106 carats uncut. The most highly prized gemstones in the world are diamonds because of their many desirable qualities and few weaknesses. On Moh's hardness scale (a mineral quality used to identify and distinguish minerals) of 1 to 10 it is the only known substance to rate a perfect 10. Diamond is the hardest substance on earth because of the unique arrangement of atoms within the mineral - they are packed closer together than any other substance. Diamond also has the highest melting point of any substance - 3,820 degrees Kelvin. It also is an excellent heat conductor and is transparent over the widest range of wavelengths. The qualities of a diamond that make it so highly valuable are its broad color range (there are more than just white or clear ones), high refraction, high dispersion or fire, very low reactivity to chemicals, and rarity. Diamonds are truly ancient stones formed deep within the earth (over 100 miles/160km deep) under extreme pressure and very high temperatures. They were brought close to the earth's surface by brief, explosive volcanic eruptions that happened between 1,100 million and 20 million years ago, carried in Kimberlite pipes that were created as magma flowed through deep fractures in the earth. The magma inside the kimberlite pipes acts like an elevator, pushing the diamonds and other rocks and minerals through the mantle and crust in just a few hours, without melting them or changing their internal structure. Many natural diamonds you see today are as much as 1 billion years old! There is still a great deal we don't know about exactly how diamonds are formed, but they exist at great depths under very high temperatures and extremely high pressures. Carbon exists in abundance in the earth and its atmosphere, but in various forms. The most stable form of pure carbon is graphite - the substance used as pencil lead. In fact, all diamonds in the earth that are near the surface are very, very slowly being converted into the more stable graphite. The natural, uncut form of pure diamond crystal comes in isometric cubes and octahedrons (see above right). The old saying "Diamonds are forever" really is true, from the human perspective. There is nothing on earth that is stronger, more durable and enduring than diamonds. Largest uncut diamond: the Cullinan weighed 3,106 carats. Largest cut diamond: currently the Kohinoor in Great Britain's Crown Jewels, which weighs 105 carats.